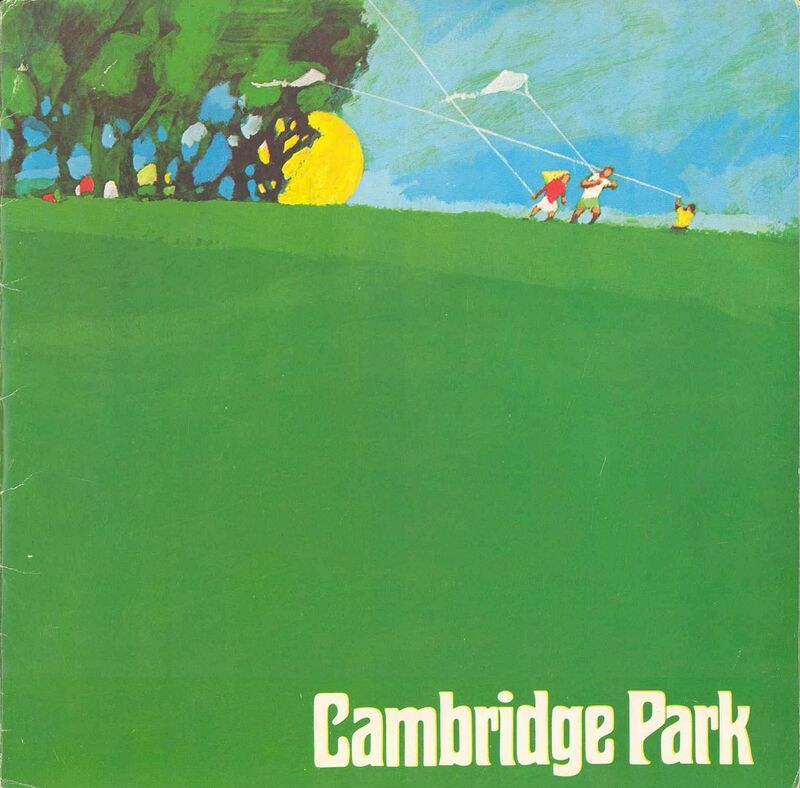 Cambridge Park has had quite a history with various developers over the years. Read a little more about the history of the tract and Levitt's experience with this project at this link. M A R L T O N, N . J. 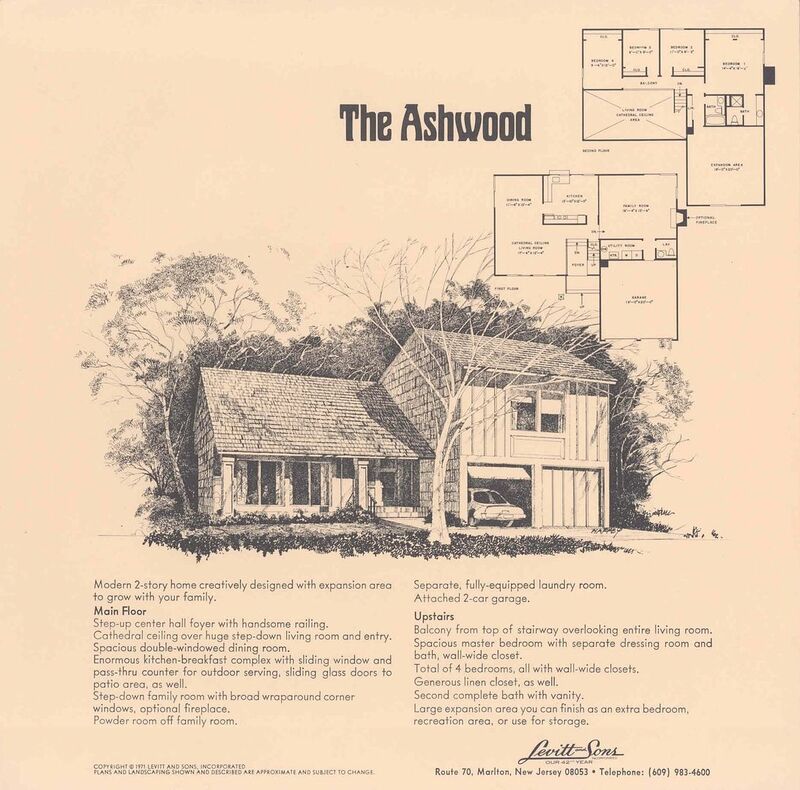 Location: Marlton, Township of Evesham in Burlington County, N.J. off Route N.J. 70. 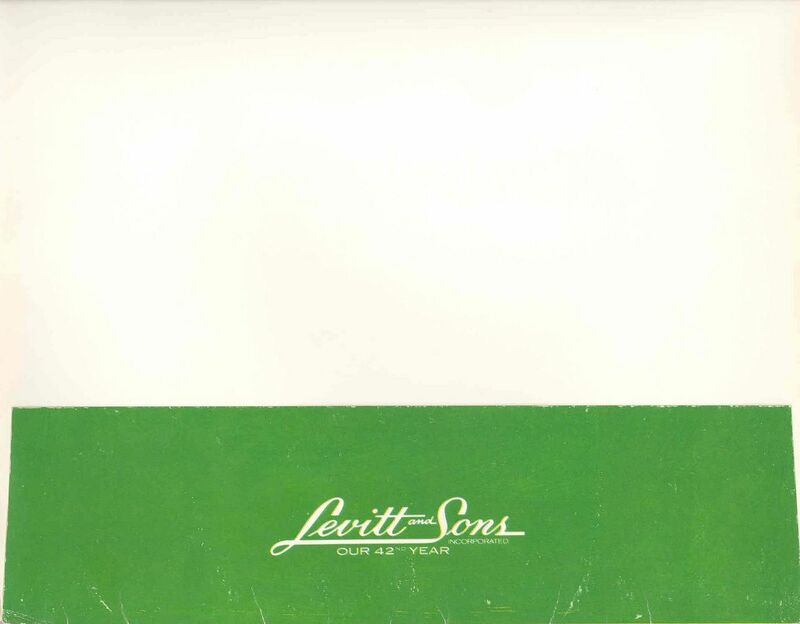 Constructed by Levitt Residential Communities, Inc. as Levitt and Sons. Opened for sales May 3, 1970. 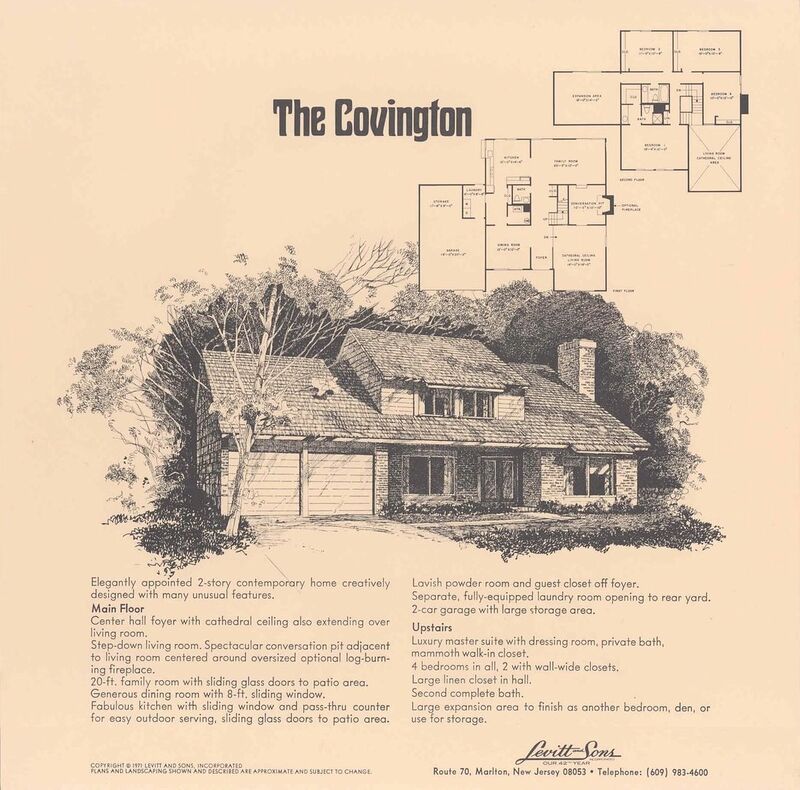 Sample Homes and Exhibit Center were located at the west end of Overington Avenue, fronting on Route N.J. 70. 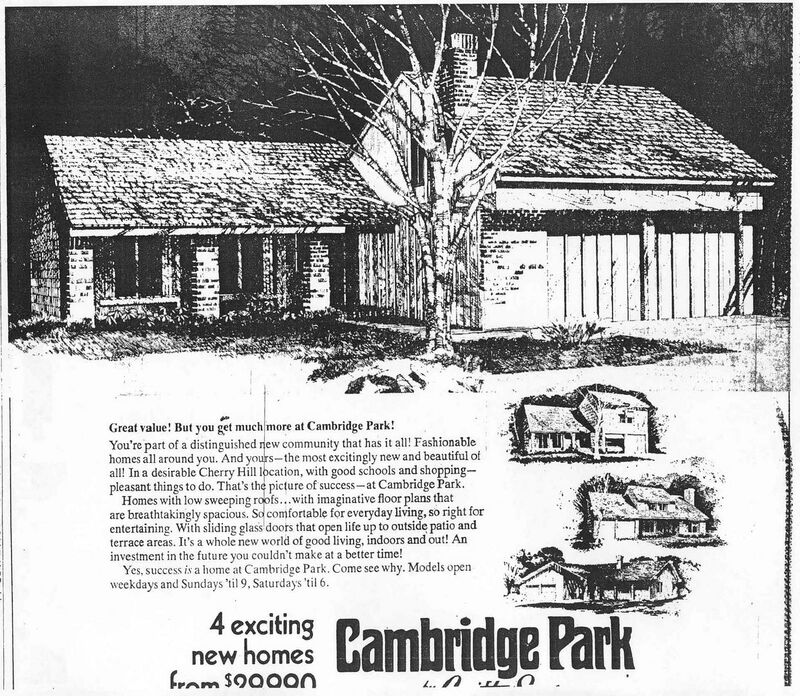 Prototype Cambridge Park Sample Homes for the Aubrey, Bedford, Canterbury, and Monterey models were constructed in Garfield Park East at Willingboro on East Stokes Road. Official website for the Township of Evesham. 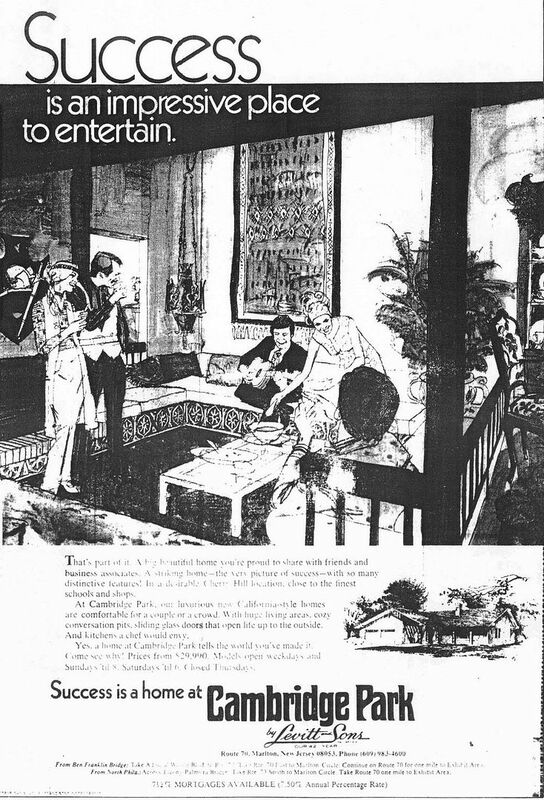 View the Front Cover, Back Cover, and the Interior Pocket of the brochure. 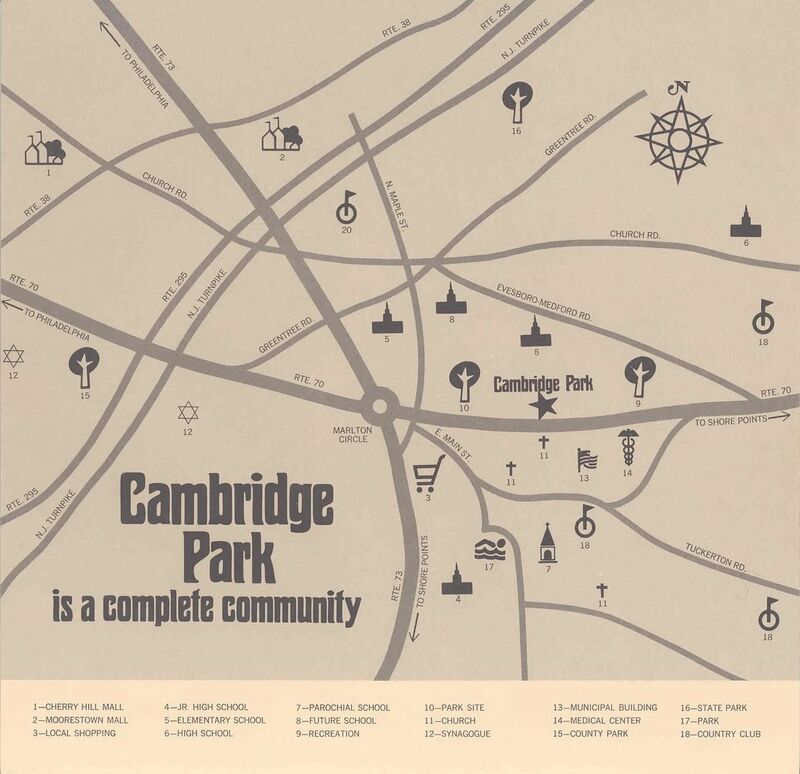 View the Community Profile for Cambridge Park. 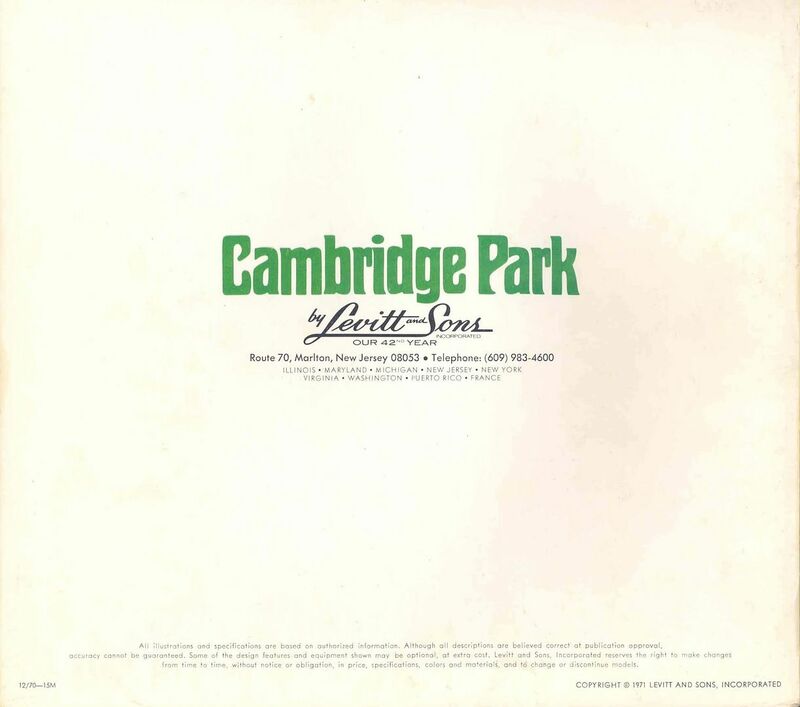 View the 1970 Price List and Standard Features for your new home here at Cambridge Park. 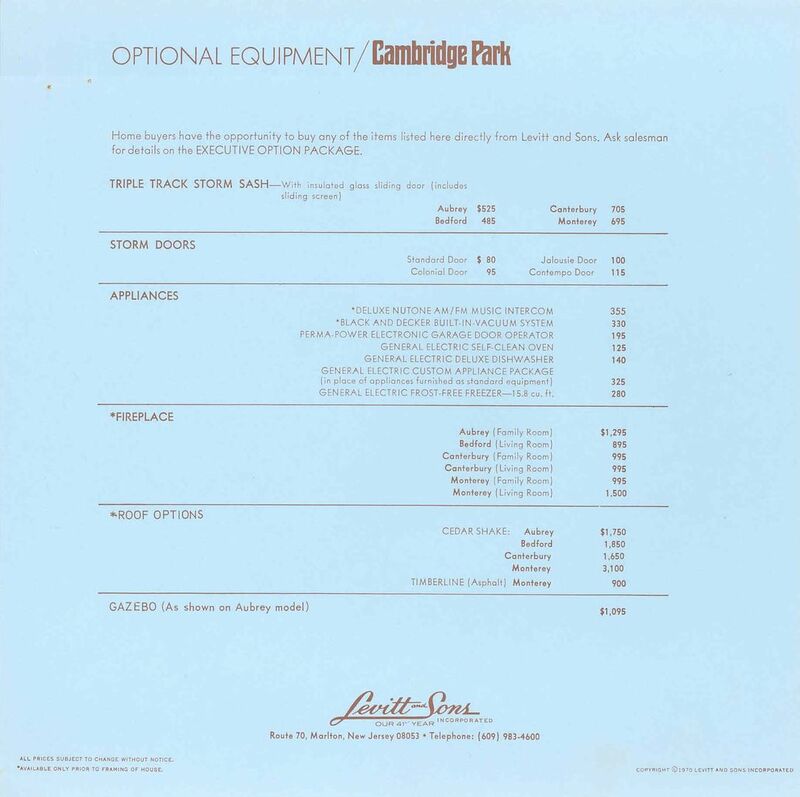 View the list of Options for 1970 that you may select for your new home here at Cambridge Park. View the Location Map for the Marlton-Cherry Hill-Moorestown area of Camden County. See how convenient Cambridge Park is to local shopping and attractions, as well as major highways to Philadelphia and the famed Jersey Shore resorts. 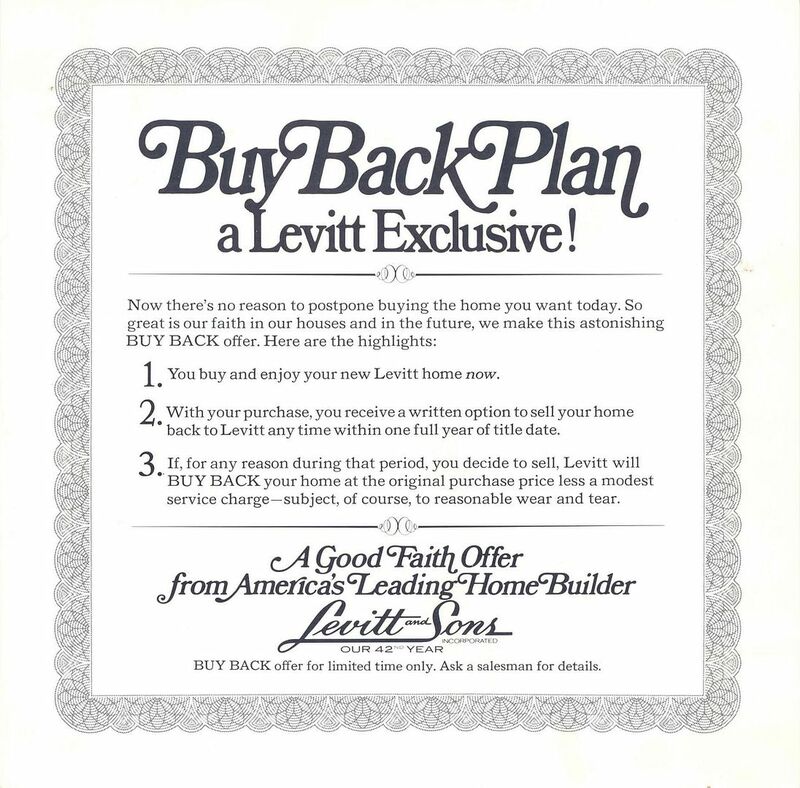 View Levitt's exclusive Buy Back Plan. 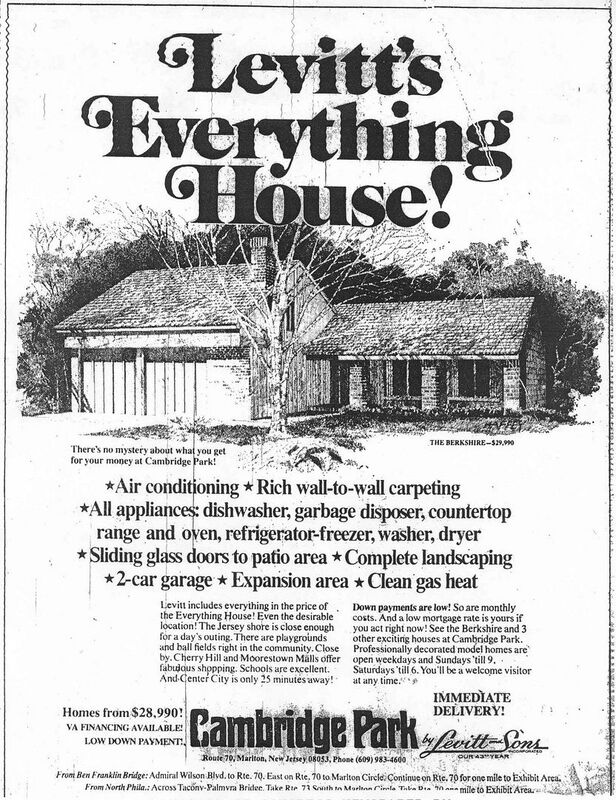 As a good-faith offer, and to demonstrate how much Levitt believed in its product, you may sell your home back to Levitt and Sons for the original purchase price during your first year of ownership. 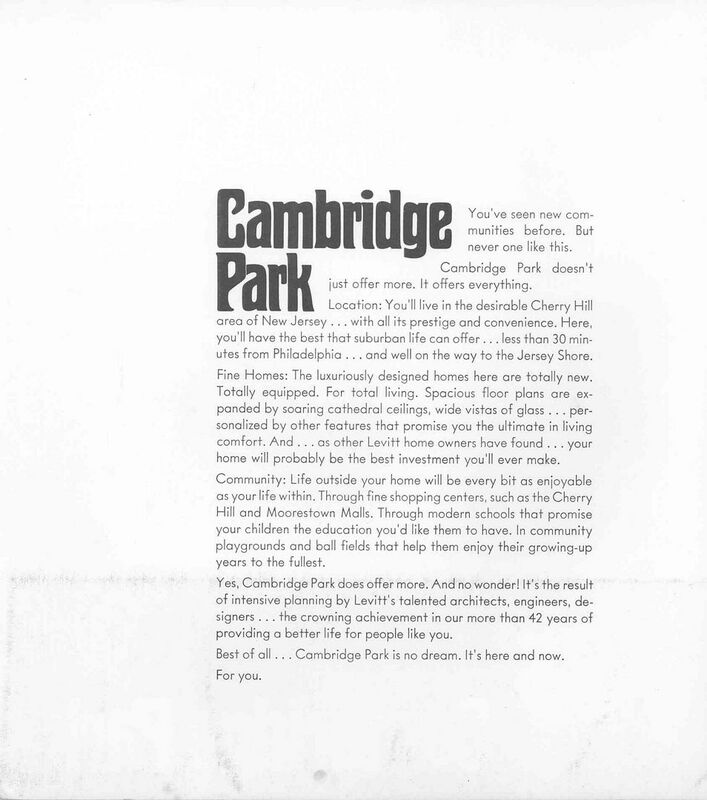 Read a few words about the dramatic interiors of the Sample Homes at Cambridge Park, designed by Darell Howe of California. 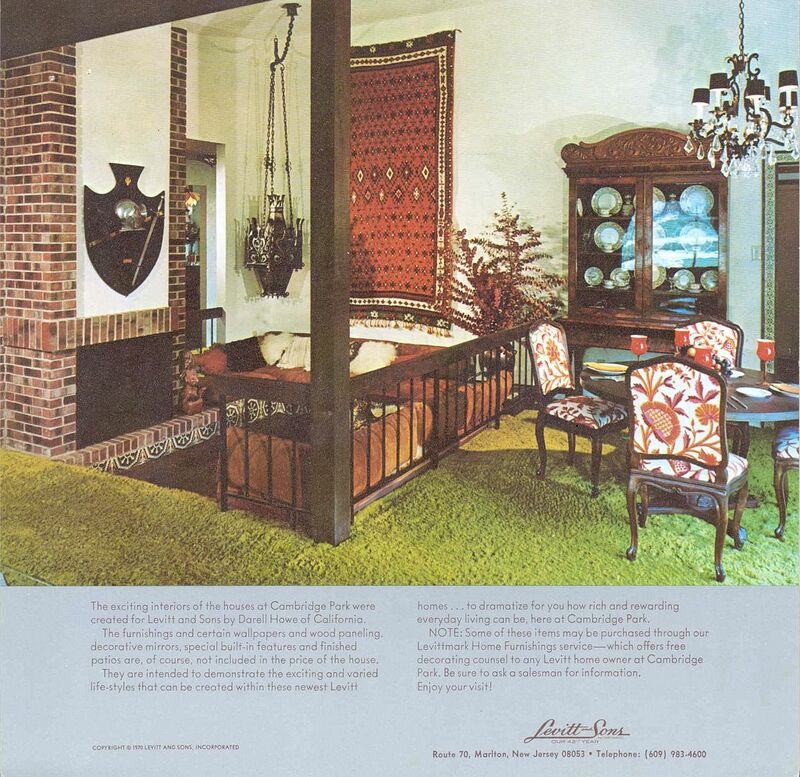 Pictured is the intimate Conversation Pit and adjoining Dining Room of the Monterey model, furnished in popular Conquistador motif. Many of the furnishings and accessories found inside the Sample Homes may be purchased separately through Levittmark Home Furnishings. Tour all eight sample homes and select the style of your new home in Cambridge Park. Three Traditional plans and five Contemporary plans are available to suit any need or lifestyle. 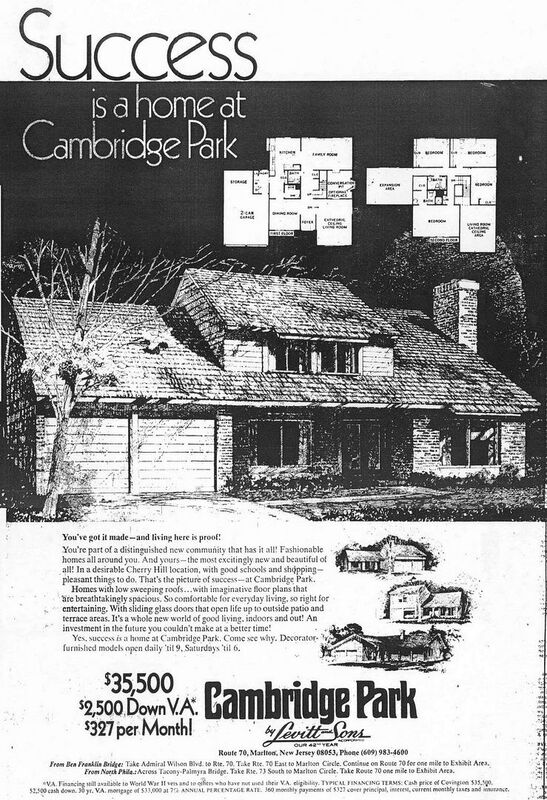 Four homes were introduced at the start of the community in 1970. 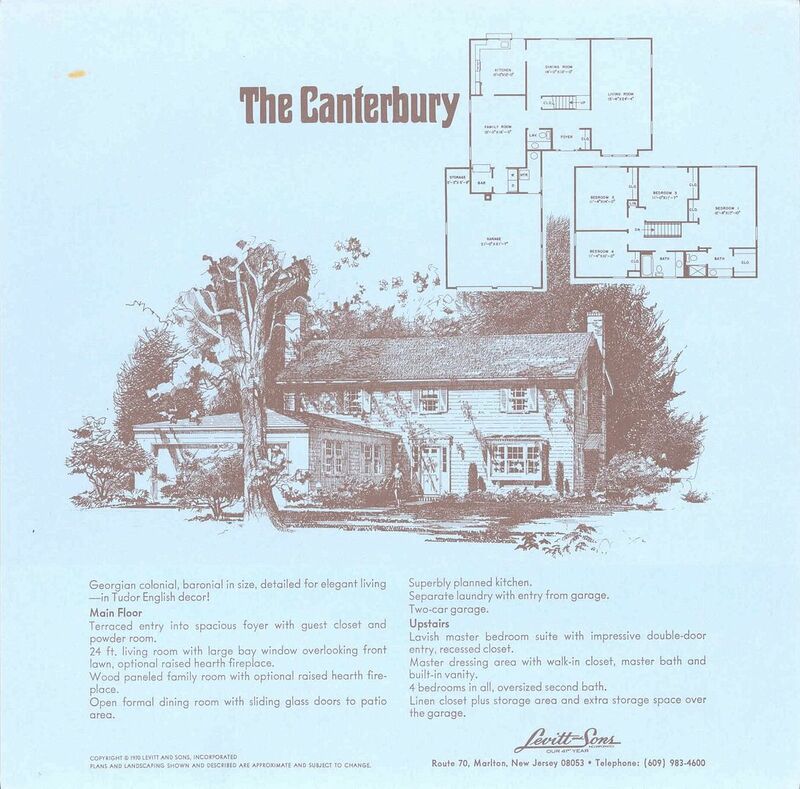 Three traditional models were available: the Aubrey, Bedford, and Canterbury. The exception is the Monterey model. Contemporary in both plan and exterior, the Monterey was also available in the 1970 line from the outset of the community, for a total of four models. 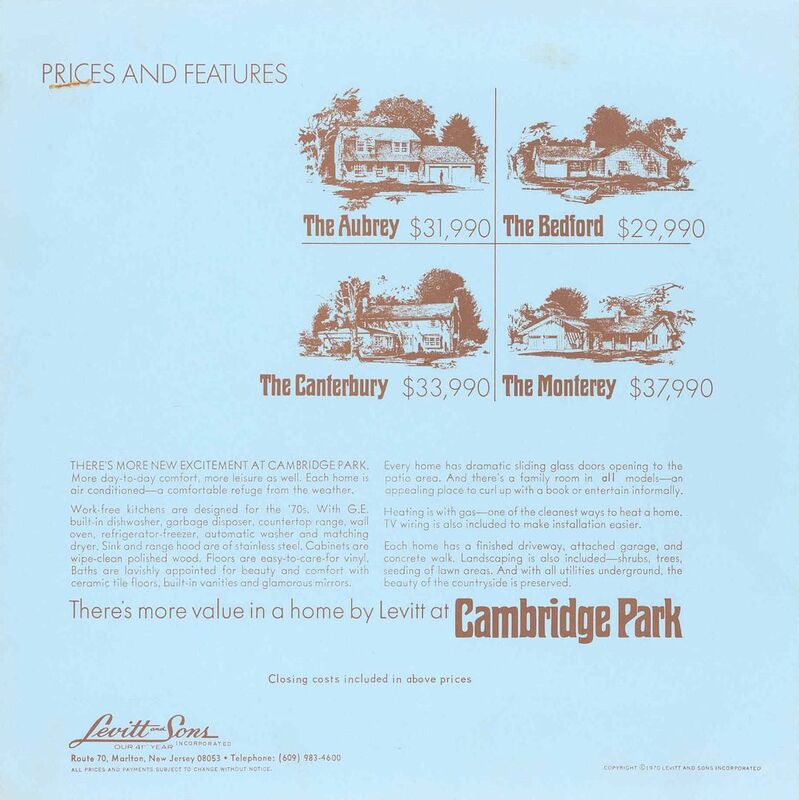 All four sample homes were constructed in Garfield Park East at Willingboro for previewing until the Exhibit Center opened in Cambridge Park. Side-hall Colonial. 4 Bedrooms, 2-1/2 Baths, Entry Foyer, Formal Dining Room with Sliders to back lawn, Eat-in Kitchen with outdoor Pass-through Counter, Family Room with optional Fireplace, Separate Laundry-Utility Room, Box Windows in all bedrooms and master bath, 2-car Garage with storage above. Rancher. 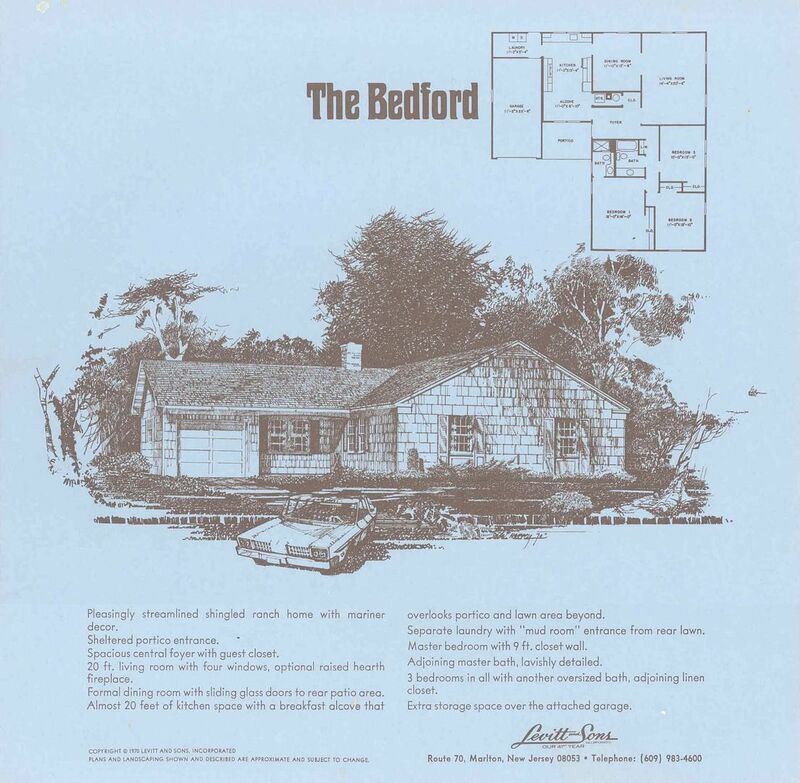 3 Bedrooms, 2 Baths, Foyer, Living Room with optional Fireplace, Formal Dining Room with Sliders to back lawn, Kithcen with Breakfast Alcove, Separate Laundry Room with access to garage and back lawn, Oversized 1-car Garage with storage above. Center-hall Colonial. 4 Bedrooms, 2-1/2 Baths, Foyer, Front-to-Rear Living Room with box window, Formal Dining Room with Sliders to back lawn, Eat-in Kitchen with door to back lawn and outdoor Pass-through Counter, Family Room with Bar, Laundry Room, Master Suite with double-door entry and Walk-in Closet, 2-car Garage with Storage area and separate Utility area. 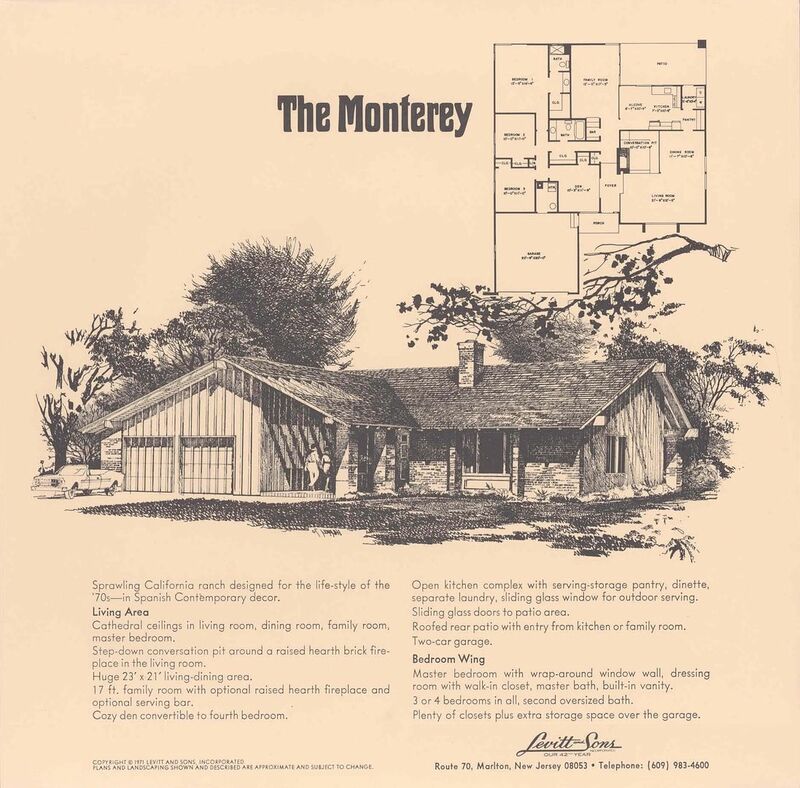 The Monterey model, available in both the 1970 and 1971 Houselines, is profiled below. 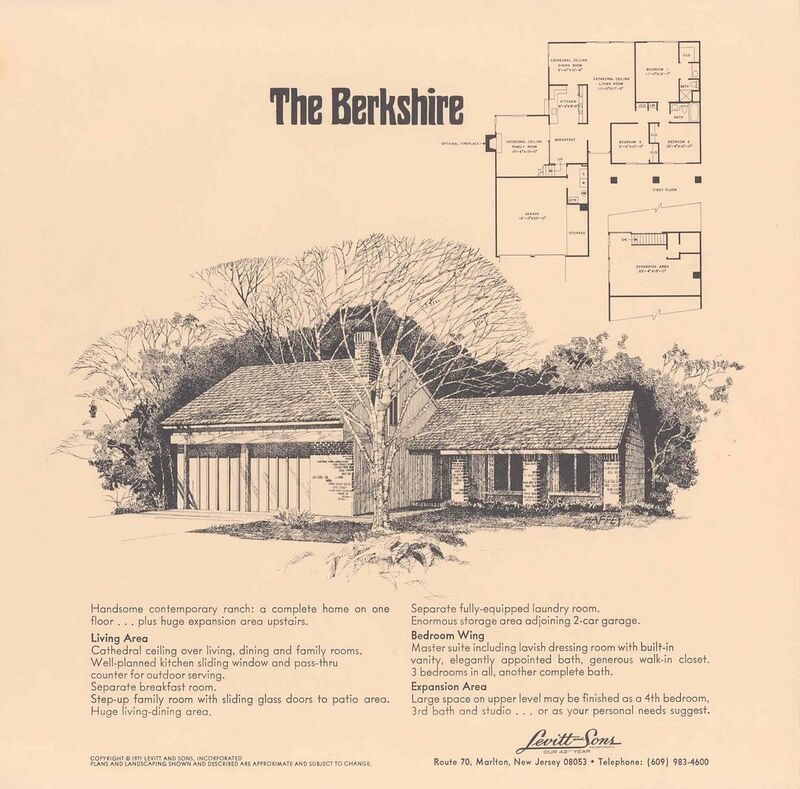 The link provided here will display the information sheet reprinted for the 1971 Houseline. 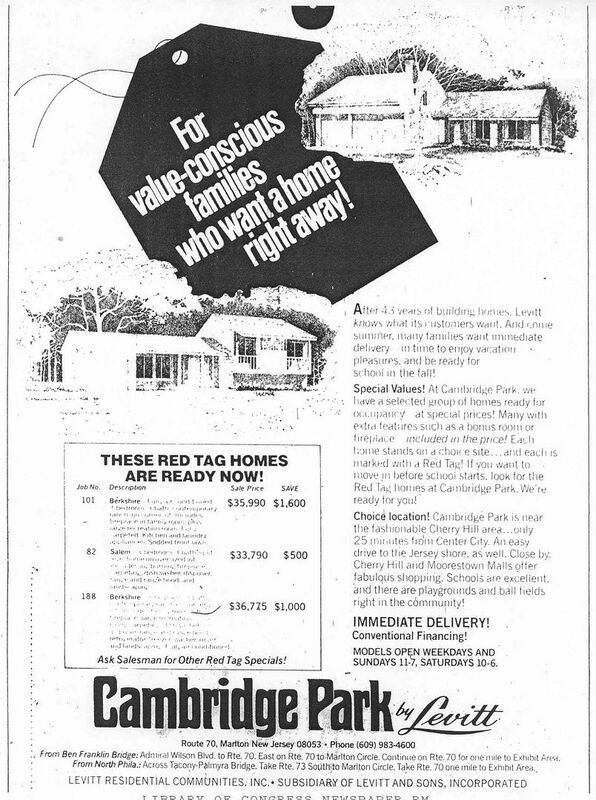 A full line of contemporary homes was introduced to the Cambridge Park sales line in 1971, replacing the traditional line of models. In addition to the Monterey, which was introduced in 1970, three contemporary models were introduced: the Ashwood, Berkshire, and Covington. A fifth contemporary model, the Salem, was also added to the line in late 1971 in the later phases of the development. 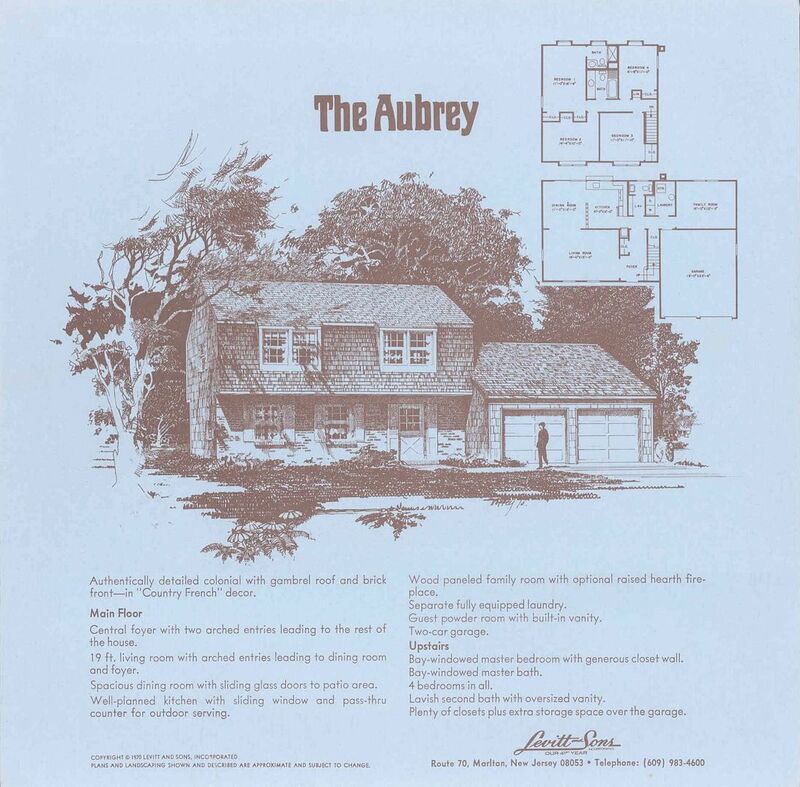 Discontinuing the traditional line of models created a more uniform style of contemporary homes throughout the remainder of the community. 2-story Plan. 4 Bedrooms, 2-1/2 Baths, Raised Entry Foyer, Living Room with Cathedral Ceiling, Formal Dining Room, Eat-in Kitchen with Sliders to back lawn and outdoor Pass-through Counter, Sunken Family Room with Optional Fireplace, Second floor Balcony overlooking Living Room and Foyer, Expansion Area, Separate Laundry-Utility Room, 2-car Garage. 1-1/2 story Plan. 3 Bedrooms, 2 Baths, Living-Dining Room with Cathedral Ceiling, Kitchen with outdoor Pass-through Counter and Breakfast Alcove, Family Room with Cathedral Ceiling and Sliders to back lawn, Second-floor Expansion Area with Balcony overlooking Family Room, Separate Laundry-Utility Room, 2-car Garage with Storage Area. 2-story Plan. 4 Bedrooms, 2-1/2 Baths, Sunken Living Room with Cathedral Ceiling, Conversation Pit with Optional Fireplace, Formal Dining Room, Eat-in Kitchen with outdoor Pass-though Counter and Sliders to back lawn, Family Room, Second-floor Balcony overlooking Stairway and Living Room, Master Bedroom with Walk-in Closet, Expansion Area for 5th Bedroom, Separate Laundry Room, Separate Utility Room, Oversized 2-car Garage with Storage Area. Rancher. 4 Bedrooms, 2 Baths, Covered Entry Portico with Exposed Beam Open Skylight, Raised Entry Foyer with Cathedral Ceiling, Living-Dining Room with Cathedral Ceiling, Conversation Pit with Fireplace, Eat-in Kitchen with Breakfast Alcove and Butler's Pantry, Family Room with Bar and Sliders to Covered Back Patio, Master Bedroom with Walk-in Closet, Den convertible to Bedroom 4, Separate Laundry Room, 2-car Garage with Separate Utility Area. Split-Level. 3 Bedrooms, 2 Baths, Living Room with Cathedral Ceiling, Kitchen with Breakfast Alcove, Master Bedroom with Walk-in Closet, Lower Level Family Room, Lower Level Expansion Area for Bedroom 4 and Bath 3, Basement, 1-car Garage. 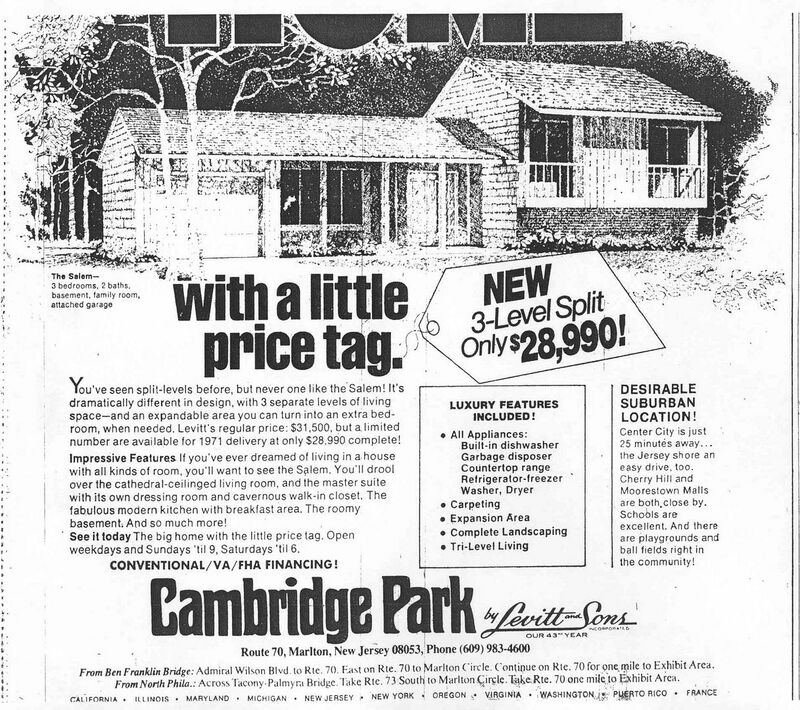 View original newspaper sales advertisements for Cambridge Park. Page last revised 24 May 2009.